Everyone on the Kinetic Bridging® Training Team is a movement and development specialist who took the journey to become a Bridging® Specialist. We merge a love of helping people overcome a developmental or movement challenge with an insatiable desire to learn how the human body works. Everyone is really passionate who works there. Driven to continuously learn more. They are all professionals wanting to do what is best for each individual that comes in. Insatiable drive to find out how and why the human body works. After each of us was exposed to Kinetic Bridging and had experienced the incredible results first hand, we all had the same idea. “I want to learn more. I want to learn why this technique is so successful where others are not.” Not only does every member of our team have that curiosity gene, but they are also active participants in testing, evolving, and perfecting the technique going forward. We thrive on solving puzzles. We get excited about doing a deep dive investigation into why a client is not functioning correctly or experiencing challenges. We work as a team to understand, test and evaluate how to best help. Then, when we discover a nuance that works, often with better and different outcomes than we anticipated, we don’t just celebrate and rest on our laurels. We get excited about building and improving on what we know, as well as sharing what we have learned, all to make a larger impact. Diverse backgrounds. 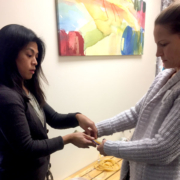 Our team members have backgrounds in occupational therapy, medical exercise and personal training, therapeutic services, and physical therapy, both for adults and pediatrics. Applying these diverse backgrounds to our clients’ problems or challenges, looking at them from several different lenses to identify the root cause of the issue. These diverse perspectives allow us to collaboratively adapt the physics-based Bridging technique applications for various challenges. However, no matter our diverse educational backgrounds, we all enjoy and excel at training others in the technique. Drive to help other people. Every single one of our team is a caregiver and passionate about helping other people. 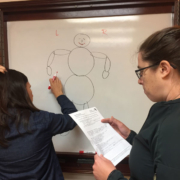 In our workshops and certification courses this manifests as a passion to help our students grow, both in knowledge as well as the impact they can make with their patients/clients. We attract professionals with that same passion who want to help people more. and caregiver or professional frustrated that they couldn’t identify a way to do more, help more. Our team has walked in your shoes. We have all looked for more tools and techniques to be able to create more impact. We meet you at the point you are at in your professional journey and support you in your quest to help people in new ways. 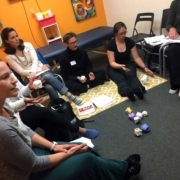 These drives and strengths back our mission to train the next generation of Bridging practitioners so more people and professionals can help their clients overcome developmental and movement challenges. Meet our team of instructors. Learn more about or how to become certified in the Bridging technique. Learn more about the journey our founder, Cara Lindell, took to discover and develop the Bridging Technique.